Jonathan Saunders presented a positively prismatic collection at a museum for Fall 2015. The Tate Britain in Millbank, the Topshop Show Space for the season, was the venue. Saunders has shown here before but a lot has changed since then. Eiesha Bharti Pasricha has invested in his label to help it move onto its next chapter. He has moved into a larger studio thanks to the injection of money into his label. He also has improved as a designer. This season’s 60’s modish outfits were a beaming rainbow in London, where dreary overcast weather was taking it’s toll on the spirit of attendees. Saunders made sure to brighten things up. The dispersion of white light into brilliant colours was on Jonathan’s colour palette for Fall. The runway was lined with coloured columns, not lined in the atypical Richard of York gave battle in vein scheme. Being a budding science student (not for long), this burst of light through a prism into a radiant rainbow is familiar. 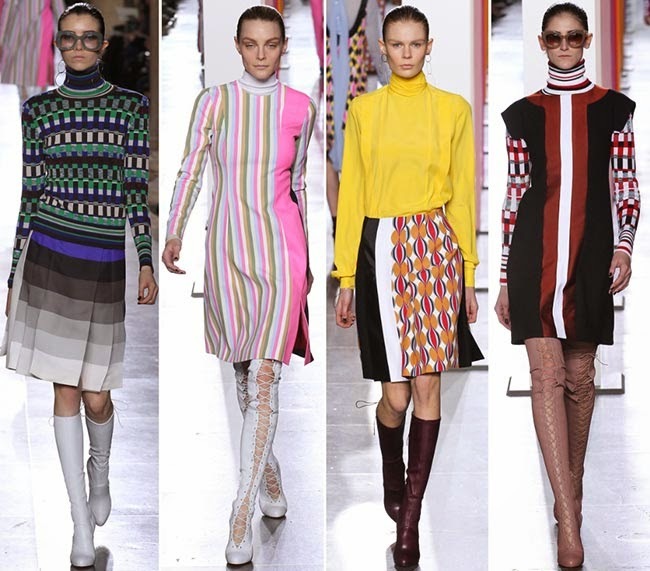 Albeit, Jonathan Saunders can make the chapter on light funky and flirty, with a 60’s flare. 3-D op art was bulging on the skirts, coats, and shirts. The artistic element was juxtaposed with stripes, and lace up, thigh high boots. Pantone cards, interior decorators’ favourites (and mine as a young child), were given a revamp the Saunder’s way. In stylish mismatched order, the looks embodied the carefree 60’s attitude. Jessica Stam made a rare runway experience wearing a green, white, pink and grey long sleeve dress with a single bright pink panel. White lace up Louboutins completed her look. Look 28, a mini dress, was in rich red, orange and white The wide neck dress was one of the best pieces in the collection. Or the coat before it worn by Mica Arganaraz. Her camel hued jacket featured white and grey details. This gentle mish mash of tonal colours was beautiful. A matching skirt, with a multicolour waistband was styled with the look. One thing I’ve noticed with London Fashion Week for Fall 2015 has been that by the show, hour, day - the collections have gotten more colourful and bright. Jonathan Saunder’s has illuminated Sunday’s packed schedule and the whole week. His unforgettable collection was probably the best collection of the week!